The unique Revolution® Portion System counts the number of times the agitator passes the shaver blade. Regardless of the motor load, the correct amount of ice is dispensed every time. Systems that calculate portions by time or weight may not be delivering consistent drink quality to your customers. The Revolution® Portion System eliminates these concerns by delivering the right amount of ice every time. 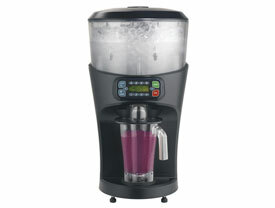 Labor Saving Operators do not have to manually add ice to the blender jar for their blended drinks, freeing them up to do other tasks.